I wrapped up our cabinets last week, but the very next day I came down with a nasty cold turned sinus infection. Wah Wah...Fortunately, I'm feeling much better today, so I snapped a few photos during B's nap. As expected, painting the cabinets white was a very tedious project that took ages to complete. But I'm wild about the results! 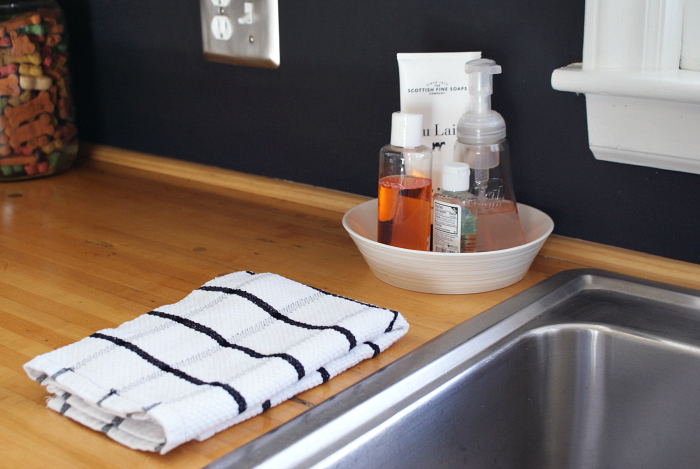 I think the contrast of the white cabinets against the chalkboard backsplash looks fantastic with the butcher block counters. It's a huge improvement over where we started when we bought the house! I work full time, so this project was all about squeezing in ten minutes here or an hour there until it was finished. The trick is to wrap up your paint tray and brushes with plastic wrap, then you can paint for several days without washing and drying your brushes. At one point, Jesse busted me adding a quick coat of paint to the doors right after work...In my favorite black dress and heels! I divided the project into thirds, taking down the bottom cabinet doors first. I spent a few minutes sanding each door to remove any drips or bumps from the previous brown paint. Then each door was wiped with a damp cloth to remove the dust, followed by several coats of white paint with light sanding in between and a finish sanding at the end. Easy work, but tedious. Very tedious. I replaced the three round drawer pulls with cup style pulls, but reused the rest of the hardware. It's inexpensive brushed nickel that I purchased few years ago. Hardware like this might be nice to have someday, but the handles I have work and look good, so there's no rush. I have two more (maybe three) small projects on my list and this super low budget face lift will be all wrapped up! What a transformation! 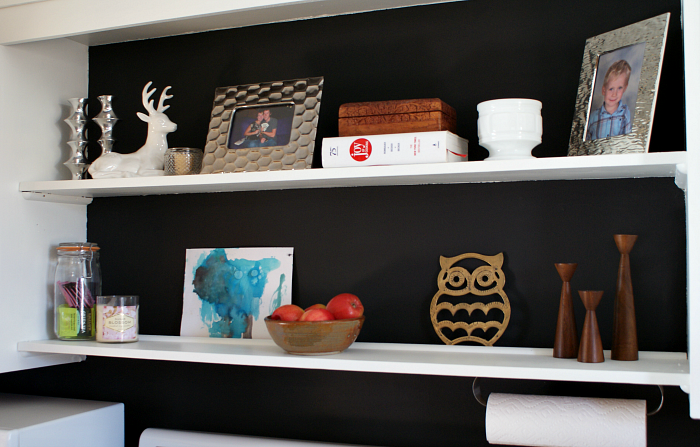 I love how you decided to go with the chalkboard paint- it makes the freshly painted white cabinets pop perfectly! Looks great and love how you styled everything! I love your kitchen update! AND ONLY $200?!?!?! You go, girl.